On Saturday November the 15th Kirsten (chairwoman) and I (education coordinator) flew to Accra, to stay in Ghana for a week and a half. Of course we also did an extensive preparation for the trip. First we slept in Accra for a few nights, so that we could meet and speak to dr. Kubio, because he was on leave in Accra. It was really nice to have the opportunity to speak to him. From Accra we went to Cape Coast for one day, to arrange a few things with Cape Coast University for medical student Mr. Vitalis, whom MUSTANGH sponsors. We also had the chance to see the hospital and the university of Cape Coast and Mr. Vitalis’ home. Sightseeing was also in the planning, we saw Cape Coast Castle, which is an old slave castle. It was very impressing. After a few days in Accra we flew to Tamale. There we had breakfast with the Archbishop of the region, an important man. He really cares for MUSTANGH and the hospital and it was an honour to be visiting him. 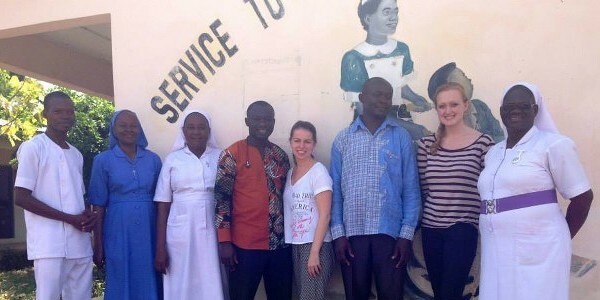 We were picked up by sr. Seraphine from the hospital and we drove through Tamale to get some things done for the hospital. We arrived at Damongo in the afternoon and we finally could see the MUSTANGH house, the hospital and the students. Kirsten and I really enjoyed seeing it all in real life, because we talked about it for so lang. It all really exists! The students gave us a tour around the hospital, it was really good seeing all of this. The next morning we started with a meeting with the management team of the hospital. It was a very valuable and clear meeting, with which we can do a lot back home. We also talked to the doctors, the administrator, Jane and Kassim, sr. Seraphine and the students. It was all really useful to see everything with our own eyes. We were also lucky that we could come watch the students doing their job, because Kirsten and I are also both medical students. We got to see them doing the ward rounds, Out Patient Department and theatre. We also got to see a Caesarian Section! It was really nice to see all of this. I really thought it was great that the students are so independent and saw so many patients on their own. We had a good time with them and we also went to see Mole National Park with them. We did some swimming and we went on a safari! All in all, it was an amazing Ghana trip which was very useful for us and for MUSTANGH. We got to see what we do it for! We were happy the students were doing so well. Now we know what we’re talking about when we speak of the hospital. It has given us inspiration and even more heart for MUSTANGH and the hospital. This trip wasn’t only useful for MUSTANGH, but also for ourselves, we learned a lot about Ghanaian culture and people and we were able to broaden our horizon!